Today I am going to be sharing part 2 of my mug collection series. I decided for this post I am going to share only Alice in Wonderland mugs since majority of mugs I own are of Alice. I didn't mention this on part one but these mugs aren't in any particular order. Let's begin! I probably sound like a broken record by now but I love Alice in Wonderland. She is my favorite Disney character and also my favorite Disney film. The next three mugs I'm going to share are all different but the similar because of the picture design. 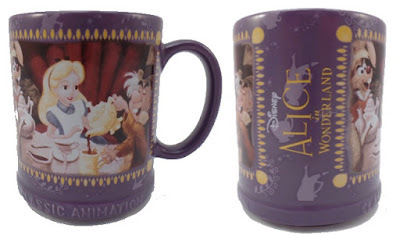 First up is the Disney Parks Alice in Wonderland Stacked Tea Cup mug. This mug is also similar to the first mug I shared on part one of my mug collection because it has the same image of Alice and the Mad Hatter at the tea party. This mug is sculpted to resemble three tea cups stacked together and is all black. The middle tea cup is painted white with black trimming of the talking flowers from the movie. 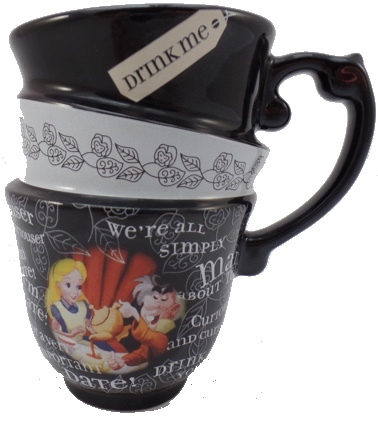 On the bottom tea cup you see Alice with the Mad Hatter in the front and back of the mug with different sayings such as; I'm Late! I'm Late! For a very important date, We're all simply mad about tea, and Curiouser and curiouser. On the outer lip of the mug there is a tag with 'Drink Me' written on it. Next is the Disney Store Alice in Wonderland Classic Animation Collection mug. This mug was released back in 2015 with I believe four other mugs. This mug has the same image like I mentioned to the stacked tea cup but the March Hare is included. On the side of the mug you have the Alice in Wonderland title and you can see tea cups and pots throughout the mug. I know this is not a mug but I wanted to include it anyway. This is an Alice in Wonderland glass cup that I purchased from Hot Topic. Even though once again this is the same image as the mugs above this was different because it isn't a mug. This cup is perfect is you're looking to enjoy a large iced beverage such as iced tea or iced coffee which is a favorite of mine. Ideally this cup would be perfect for that but hey you can drink whatever you want out of it. I really wished I grabbed one more of this cup so that I at least had a pair since it would be so cute to have in the kitchen for guests. The next mug, this one is actually one my mom bought from Urban Outfitters maybe six or seven years ago. I had to take it from her because its Alice in Wonderland. This is probably the most different Alice mug I own because it contains the Lewis Carroll original Alice in Wonderland art. I'm usually not the biggest fan of this version of Alice because I'm devoted to the animated version but I actually love this mug. It looks like a very large tea cup and I like how the top lip of the mug has somewhat of a scalloped trimming. 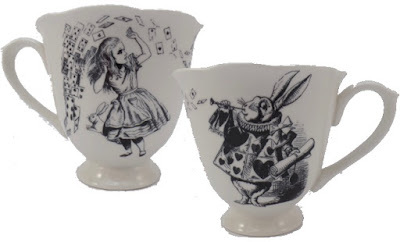 On one side of the mug you will see Alice what looks like she's being attacked by floating cards and then when you turn the mug to the other side there is one of the famous images of the White Rabbit blowing a horn wearing his heart pull over vest. Lastly I have my Disney Store Alice in Wonderland Record Cover mug. I purchased this mug online at the Disney store while it was on sale. I'm so glad I ordered it when it was on sale because I had never seen this specific mug in stores. This mug is beautiful it and contains all the characters form the movie. That is what I love most about it and because they all look vintage. 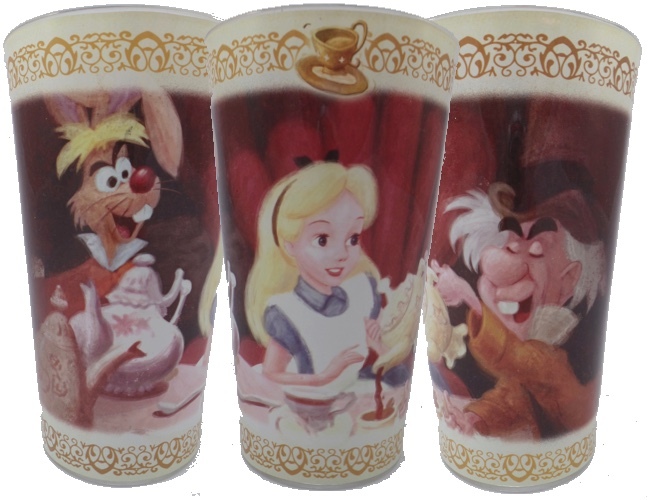 I really wish Disney would release more Alice items with more of the characters from the movie. I also really love how the inside and handle of the mug is mint. I hope to see you on part 3 of my mug collection. Here's a little teaser; it'll be my more spookier mugs! I really like that vintage Alice mug and I've also never seen that mug in stores. I was so happy I spotted it online and on sale! I love all the Alice mugs!I should of made one post with all of my Alice mugs. I think I might still be able to make one post with only alice mugs, maybe. I still have a few more Alice mugs I need to share😂 the obsession is real. For reals the obsession is real. Every time I take pictures of them I'm like am I almost done with this my mug collection? I want to start on my other collections. I can't wait to see what other collections you have coming up!